Black enamel, texturing, dangling chains and a flower with leaves are all features found on this antique 14K yellow gold watch pin. 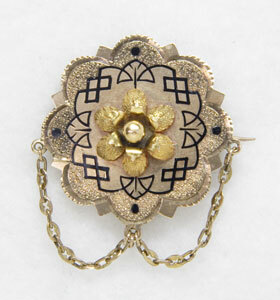 The central flower is crafted in three dimensions giving the pin an even greater appeal. It is a phenomenal piece with exceptional detail. 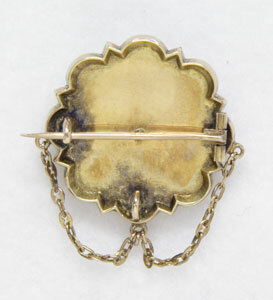 The chatelaine pin measures slightly over 1” in diameter. Circa: 1880.